The organisation said it called into question the point of designating areas with special protection if heavy engineering projects were to be allowed. The three hydro plants were approved by Highland Council at a special meeting. Mountaineering Scotland, which represents climbers, hillwalkers, mountaineers and ski-mountaineers north of the border, called on the Scottish Government to review the decision. Stuart Younie, the organisation’s chief executive, said: “This is a disappointing decision by the Highland Council. “It brings into question the purpose and value of allocating special designations which are intended to help protect our finest landscapes. We understand the arguments being made in support of the proposed developments but feel there was a wider point of principle at stake today. 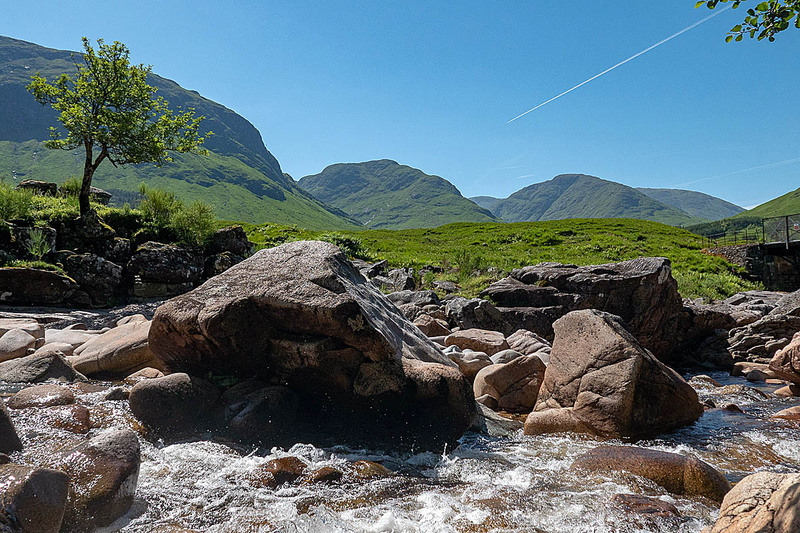 Seven applications were submitted to build hydro schemes on both sides of Glen Etive, which is currently designated as a national scenic area and identified as having outstanding wild land qualities. Mountaineering Scotland said each of the schemes would involve new road construction, bridge building, trench digging, cement pouring and power cabling, for a relatively low power output. It agreed that four of the proposed hydropower schemes fitted in with the already developed forestry plantations, but objected to the three applications on the eastern side of the glen which it said would spread development up the slopes, damaging the wild qualities of the mountainsides. Members of Highland Council’s planning committee visited the glen for themselves before approving all seven applications at a meeting in February. There was widespread outcry at the decision and independent councillor Andrew Baxter gained sufficient support for a motion to call a special meeting of the council to review the decisions in respect of the three most contentious applications: Allt Ceitlein, Allt Mheuran and Allt Chaorainn. A change.org petition against the three most controversial schemes has attracted more than 12,000 signatories. “We would call on the Scottish Government to review this decision and to look carefully at how we protect a place that is double locked by landscape protections, between being a wild land area and a national scenic area. Conservation charity the John Muir Trust added its voice to those of Mountaineering Scotland, saying Scotland’s wild places are being diminished in pursuit of private profit. It too had objected to the three schemes because of their potential impact on a popular and accessible scenic landscape within a wild land area. “The trust took a measured approach when objecting to the proposals as we are very concerned at the continued diminishing of Scotland’s wild places at the hands of developers whose sole objective is private profit. Developers Dickins Hydro did not respond to grough’s request for a comment. Appalling greed by subsidised toffs, all for the sake of the energy equivalent few hundred kettles. Pathetic. I'm just glad I got up there a few times before the area was destroyed forever. I agree with Mike that greed is the true motivator in this case. The directors of Dickins Hydro nearly all have south of England addresses. How much do they care for Glen Etive - very little. To have seven schemes in Glen Etive means there is hardly a burn left without a scheme on it. Come on Scottish Government - do your job and honour the purpose of having Wild Land Areas designated!! I am not very confident, I'm afraid. Green Energy. I think not. We need to be cutting back on energy consumption not destroying our last bit of Wilderness. There has got to be better way but hey too much money to be gained by Dickens Hydro and the Scottish Government. Tourist Board for Scotland will be keeping quiet. People do not want to go to beautiful places to see concrete dams and flooded valleys. It won't be just the valley that will suffer, what about the distribution of the power ? The problem is that the concept of wild land is completely alien to the average person. Taking councillors to the scene of this putative vandalism would therefore do absolutely no good whatsoever. How many hills have they climbed? How many hours spent tracking a pristine burn roaring with life? The spirituality of clean, free running water, silver over hard washed rock is known only to those few who make the effort to learn about it. It is a great paradox that Highland councillors understand less about the hallowed turf they should be protecting than city dwellers like myself and thousands of others who appreciate the gift of wild places. We have seen the same vandalism in Glen Falloch and this within a so-called national park. The confident roaring Falloch has been reduced to a snivelling rivulet, just what we will have in Glen Etive in the near future unless something is done very quickly. Soon there will hardly be a river in Highland Scotland that runs free. I am so disappointed at Highland Council’s decision. How short sighted and irresponsible. Disgusted with this decision. It sets a hugely dangerous precedent. So how can it be appealed? How can those of us who care motivate the vast majority of the population who don't care? What is the point of the planning designation "National Scenic Areas"? Why are we killing the golden goose that is Scotland's beautiful scenery and wild land? It is incomprehensible to me, and I feel powerless to do anything about it. And how ironic that these schemes are "sold" on the basis that they are "saving the environment". Like wind farms (which are just as obnoxious) they manifestly are not.
" . . . area of great importance for outdoor recreation." Mountaineering Scotland might also consider the way government and its many agencies (whatever the arguments or justification) encourage people to venture into "our finest landscapes". If individuals want to go to the hills they will discover them. The unintended consequences of 'encouragement' appear to have been given little consideration - brushed aside for the sake of 'outdoor recreation'. We can hope the whole series of 7 proposals will now be called in by the Scottish Government. It appears that SNH "sat on their hands" throughout, merely citing renewable power directives and obligations as being more significant than protection of final regions with designated wild land. A legally enforceable assessment system must be put in place to make quite sure at the planning stage that more energy will be produced in the 25 years, than has been required to create machines and components, excavate trenches, fabricate engineered structures, pipes and turbines, cable and pylons, quarry stone to make roadways and new bridges. If the projected overall energy can be calculated and any show a probable deficit then no small scale scheme should ever be permitted to move from paper to reality. All 7 Glen Etive schemes appear likely to be energy deficient in these terms over 25 years. Its going to cost more carbon to build them than can ever be saved by them.There does not appear to be any overall bonus from trying to construct these 7 turbines at all.